Location: Set back from the road E of the entrance to Queen Anne Square. Built in 1893-5 by H.W. Wills, architect of Swansea, as a women's hall of residence for Cardiff University, which was founded in 1883 as the University College of South Wales and Monmouthshire. Originally the Corbett Road elevation was asymmetrical with 2 Flemish gables to the front, but a 3rd gable was added after 1908 to make a symmetrical front. The building is first shown in this form on the 1920 Ordnance Survey. Further additions were also made at the rear in the early C20. A neo-Georgian detached wing to the NE, incorporating a ground-floor library, was built in 1938-40 by Verner O. Rees, architect, and a detached N wing was added in Modern style by Verner Rees, Laurence & Mitchell in 1963. A Jacobean style 3-storey with attic, 7-bay hall of residence of brick with terracotta dressings, tile roof behind coped gables, and brick stacks. The symmetrical front has mullioned and transomed windows with moulded drip stones grouped under 3 linked Flemish gables with open pediments and apex obelisk finials. The lower storey has a deep cornice with billet frieze. The central doorway has terracotta detail including rusticated Tuscan half columns on square bases and terracotta entablature crowned by obelisk finials. The entablature bears a relief inscription recording the date of the building and founding of the University College. The doorway has a round arch with continuous egg-and-dart moulding and keystone. Double panelled doors have a leaded overlight with heraldic stained glass. Immediately flanking the doorway are 3-light windows, then 2-storey 3-light bay windows (double transomed in the lower storey) with open strapwork parapets, on the outer sides of which are tall 3-light windows with double transoms. The middle and upper storeys have windows similar to the lower storey but with 3-light window over the doorway flanked by 2-light windows. In the upper storey, above the bay windows, 3-light windows open to balconies. The attic has 5-light mullioned windows in each gable, of which the central window is framed by Ionic pilasters. The 7-window L side wall faces Queen Anne Square. It has a deep cornice between lower and middle storeys continuous with the front. Two-storey canted bay windows have openwork parapets, between which is a central 3-bay loggia below the middle storey balcony. The loggia has terracotta detail including Tuscan columns with keyed arches, an open central bay and pierced strapwork balustrade to the outer bays. Inside is a boarded door with strap hinges on the L side under an elliptical arch and 2-light window above, and a 2-light window to the R with double transom. The balcony has an open strapwork parapet. Flanking the 2-light double transomed bay windows in the lower storey are two 2-light double transomed windows to the L and a similar window to the R. The middle storey two 2-light windows opening to the balcony, a single-light window to the R two 2-light windows to the L of the bay window. In the upper storey is a similar arrangement of windows with 2-light windows to the balconies of the bay windows. A central shaped gable with obelisk pinnacle has a 5-light mullioned attic window with Ionic pilasters similar to the front. Behind the parapet are 2 flat-roofed dormers. At the L end is an added single-storey projection continuous with the elevation, which has a 2-light double transomed window with brick dressings. The R side wall is plainer. It has 2-light windows in the middle and upper storeys with plain mullions, to the R of which it is lower and only 2 storeys (behind which is a small open courtyard). Beginning at the L end, it has a 2-storey canted bay window, then a doorway with side and flanking lights in a surround with pilasters and pediment, below 2 upper-storey windows, then a second 2-storey canted bay window. Further R, in the lower storey, is an inserted window, two 2-light windows, a doorway with mullioned overlight, and 2-light window. In the upper storey is a 2-light window over the doorway, a 3-light window to its L, and at the R end a 3-storey projection with linking bridge to a wing added in the 1930s, which has brick-mullioned middle and upper storey windows above an earlier terracotta-mullioned lower-storey window. The rear has brick-mullioned windows to projections added in the early C20. Set back at the R end is the N end wall of the original building. This has a single-storey projection, above which is an enclosed bridge to a detached wing built in 1963. Otherwise the elevation retains terracotta-mullioned windows and 5-light attic window. On the L (NE) corner of the rear is a 5-bay 2-storey brick link to a wing of 1938-40. The bay at the W end has a round-headed arch to a through passage. The remaining bays constitute an arcaded cloister with round-headed arches, with a similar single bay to the return at the E end. The upper storey has replaced windows. The detached 6-bay brick wing has French doors to a library in the lower storey, and replaced middle and upper-storey windows with sill and lintel bands. A further bay is set back at the L end. The entrance vestibule with 3 arches leading to the rooms at the rear and the stairway, which has turned balusters. To the L of the entrance are a common room and dining room. The common room at the front has 2 fireplaces with canopied wood surrounds, strapwork mantels and Ionic columns. Between common room and dining room is a wooden screen with strapwork pilasters. Offices are in the lower storey on the R side of the entrance. 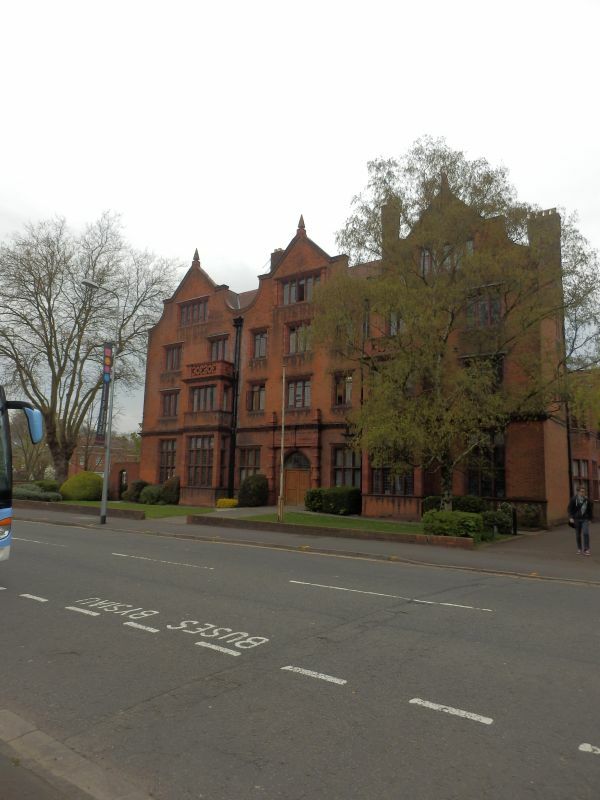 Listed for its strong Jacobean character, retaining high-quality terracotta detail, and occupying an important location contributing historic integrity to the N end of the civic centre. Approximately 0.5km NW of the civic centre, set back from the road with walled forecourt on its S side. Opposite E side of Alexandra Gardens, on a large site backing on to Park Place.